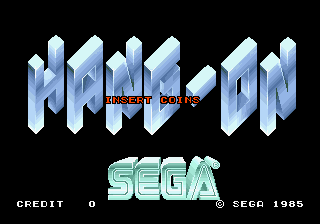 Hang-On (ハングオン) is a 1985 arcade game developed by Sega AM2. One of Yu Suzuki's designs, Hang-On is notable for being the first full body experience arcade game, as some cabinets were shaped like bikes that the user had to ride on. It was built on the arcade Sega Hang-On hardware that later powered Space Harrier. The objective of the game is similar to OutRun - keep racing until the time runs out while making sure not to hit any other racers or obstacles. The arcade version of the game includes advertisements for Bridgestone, Shell, Garelli Motorcycles, TAG, John Player Special cigarettes, Forum cigarettes, and for "Marbor cigarettes". The advertising for cigarettes both in Hang-On and the later Super Monaco GP was criticised as these games were also marketed for children. Many re-releases of these games omit these adverts. The title is derived from when the biker is turning and has to "hang on" to the bike while the bike is leaning, which Suzuki had read in a Japanese bike magazine, though he later learned the technique was called "hang off" in North America. Nevertheless, he chose to keep the former name. To develop this game, Suzuki told G4TV, "I rode on motorcycles a lot. When we came up with the prototype (for the arcades), I would ride on that prototype bike for hours and hours every day." His and AM2's efforts culminated in Hang-On. It began the "Taikan" trend, the use of motion-controlled hydraulic arcade cabinets in many games of the late 1980s, two decades before motion controls became popular on video game consoles. It was also one of the first arcade games to use Sega's Super Scaler technology, allowing three-dimensional sprite-scaling at high frame rates, which was handled in a similar manner to textures in later texture-mapped polygonal 3D games of the 1990s. Hang-On's chiptune music was also notable for introducing digitized drum sounds. Hang-On was ported to the Sega Mark III as a launch title (along with Teddy Boy Blues) in Japan. Consequently, it was brought overseas to the Sega Master System and also made available on launch in Europe (where it was distributed on Sega Card with launch Master System consoles in several regions). The Master System Hang-On later became a built-in game and in 1990 was re-released on cartridge, also in Europe. In North America, the Master System Hang-On was never released on its own, instead being part of Hang-On / Safari Hunt (built into some Master System consoles and also released on cartridge) and later Hang-On / Astro Warrior. Hang-On was also made available for MSX computers, and was succeeded by Super Hang-On in 1987, which gained wider recognition as it was ported to more systems, including the Sega Mega Drive. A similar game known as Hang-On II was released for the SG-1000. Hang-On is featured as a mini-game in both Shenmue and Shenmue II. It is also possible to buy a Sega Saturn port of Hang-On in Shenmue under the Sega Ages label - this version was not released in real life, but as similar games such as OutRun and Space Harrier were re-released for the Saturn, it is entirely possible that a version of Hang-On was planned too. The Hang-On bike is a hidden vehicle in Power Drift. An unlockable gear in Sonic Riders will play the Hang-On theme when used, as will inputting the name "H.O" in the high score table of Daytona USA. NEC Retro has more information related to Hang-On.